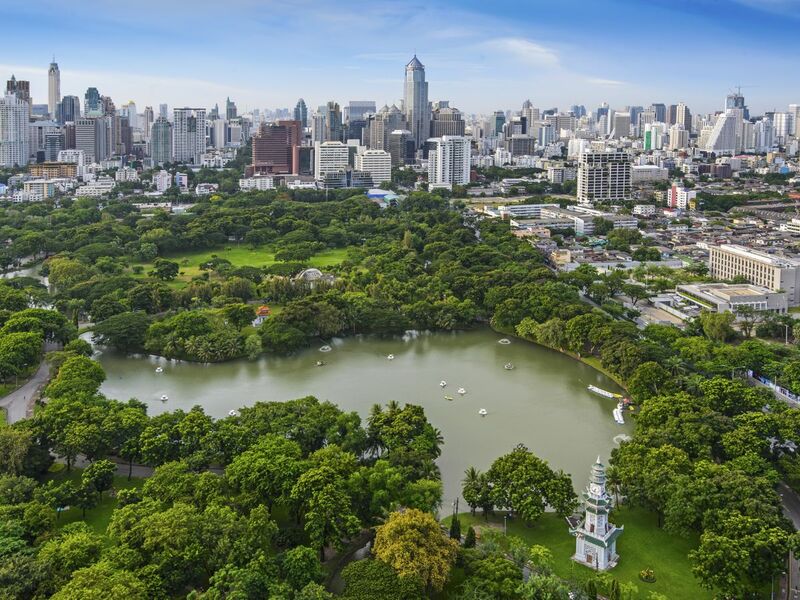 Lumphini Park covers an area of 360 rai in the downtown area of Bangkok. 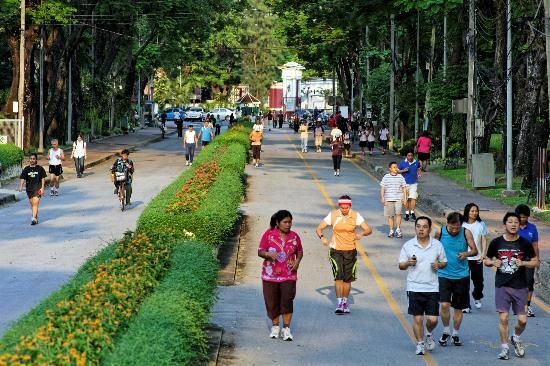 Lumphini park is not just an ordinary park, where people go for running and relax. In the park, there are many facilities offering to public, such as fitness center, vocational training center, library and many more. 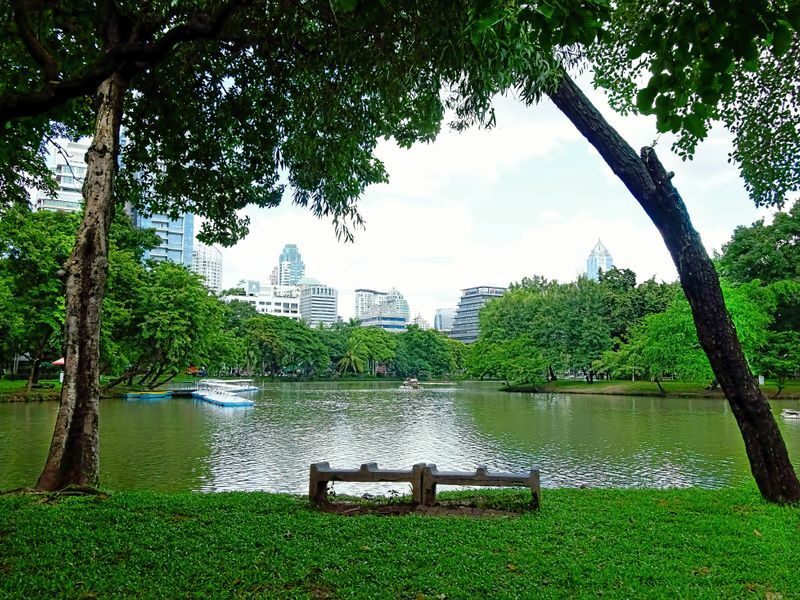 It is one of the biggest parks in Bangkok. The length around the park is approximately 2.5 kilometres. Lumphini Park opens everyday from 4.30 a.m to 9.00 p.m. Many people come here in the early morning and evening for jogging. For the bike lover, it is allowed to cycle during 10:00 a.m to 3:00 p.m. Smoking and pets are not allowed in the park at all time. The name of Lumphini Park originally comes from the birth place of the Buddha in Nepal. It is the best getaway place in Bangkok that gives you the complete peaceful moment without having to leave town. There are many trees that protect you from the sunshine. Sitting by a large artificial lake, feeling the breeze, this is a great escape from the rush in the city. Lumphini Park used to be a museum to show many products and natural resources when it was built in 1920s by King Rama VI. However, after the World War I, the place was renovated and become the first park in Bangkok with a statue of King Rama VI standing in front of the park. During the World War II, this place was used as a Japanese Army camp. At Lumphini Park, there are many activities to do for all people. Kids can go play in the playgrounds. Lovers or a group of friends can rent paddleboats and enjoy the good fun relaxing moment. Or if you want to do exercises, you can go running around the park or practice t’ai chi, a Chinese martial art, in the morning. In the evening, aerobics class is open for everyone to join. There is also a fitness offering at Lumphini Park with a very affordable annual membership fee. If you do not want to pay for it, there is also machines around the park where you can use for free. Late at night, there is usually prostitutes, both males and females, standing around park on the outside. Lumphini park is commonly visited by Bangkok's residents in the morning and evening after work hour. The park's central location makes it appealing for visitors to come especially on weekend. You will be able to see how locals of all ages come to excercise and socialise.